Think back over your life to the times when you have trusted and waited for God . . . did He not always do as He said? Did He not bless you with His peace and treat you with compassion? 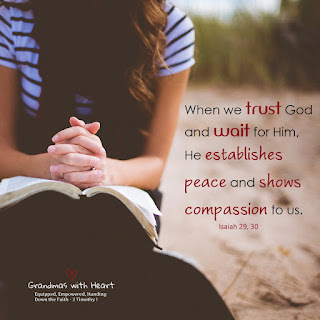 Share with your grandchildren how this has happened in your life and pray this week your grandchildren will learn to trust God and wait for Him and as they do they will experience God's amazing peace and see how He shows them His compassion!